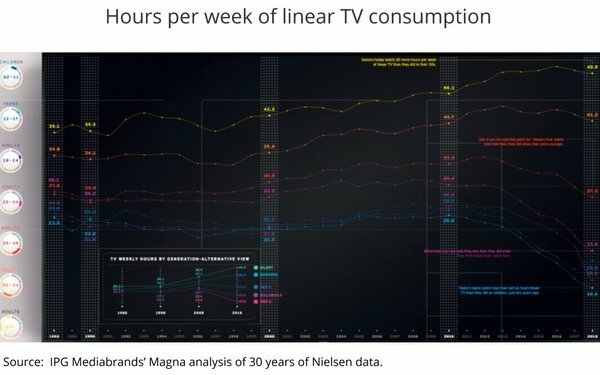 In what may be the most in-depth analysis ever of TV viewing patterns across the generations, IPG Mediabrands' Magna unit has published new data showing a pronounced stratification of linear TV consumption over time, with the oldest demographics expanding, but the youngest ones crashing as they migrate to new content alternatives. The graphic depicted above likely is impossible to eyeball, but it represents an analysis of 30 years of Nielsen data of time spent by each generation watching linear TV. The ascending lines represent the oldest demos, the descending ones represent the youngest ones. “Generation X marks a tipping point for linear television as we know it today,” Magna Executive Vice President-Audience Intelligence & Strategy Brian Hughes writes in his introduction to the report, noting that “they are the first cohort that watch less today than they did when they were younger. The 27-page report drills into granular detail how each generation's viewing patterns have migrated across the full spectrum of video supply, and especially how younger demos have embraced digital platforms like YouTube, not just as a source for content, but as a "search engine and a learning hub, creating a number of ways for brands to connect with them at the right time." The report also drills into the economics -- especially the supply and demand of ad budgets and the allocation of the media mix -- associated with these demographic shifts. 1 comment about "Magna Dives Deep Into Demos: 30-Year Analysis Reveals Polarization Of Linear TV, Ad Spending Too". Carl Langrock from Allscope Media, March 4, 2019 at 12:11 p.m.
How do we get a copy of the 27 page report?